On January 21, millions of Americans will observe Martin Luther King Jr. Day — a day commemorating an extraordinary leader who died fighting for black civil rights and racial equality in America. But as most of us honor Dr. King's legacy, two states will spend the day also honoring the very hate he worked so tirelessly to eradicate. In Alabama and Mississippi, the third Monday is not only MLK Jr. Day, it is also Robert E. Lee Day — a state holiday celebrating Confederate General Robert E. Lee who ruthlessly fought for the right to keep black people enslaved. While it is horrific that these states celebrate the two men on the same day, the real horror is that they even celebrate Lee at all. Sadly, they aren't alone. 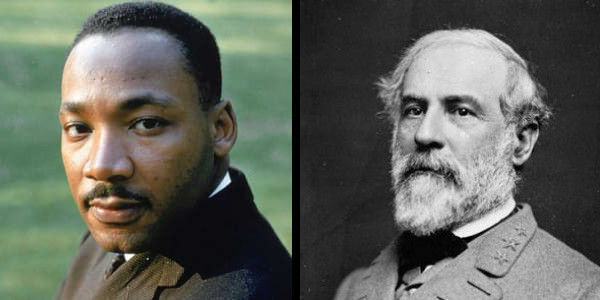 Florida and Arkansas also celebrate Robert E. Lee Day, just not on MLK Jr. Day. Please sign this petition demanding that Alabama, Arkansas, Florida, and Mississippi all end Robert E. Lee Day immediately. Let's be clear — Robert E. Lee was a traitor to the United States of America. After taking an oath to serve the country, Lee resigned from the U.S. Army in order to join the Confederacy's war against it. Known for his tactical brilliance, Lee was responsible for the death of over 700,000 combatants and civilians during the four-year war. Those who laud Robert E. Lee as an American hero claim that he and the Confederacy were simply fighting for states' rights, and while there may be an inkling of truth to that, the fact is they were specifically fighting for states' rights to own black people as property. It's time we stop trying to sugarcoat the truth — Robert E. Lee's legacy is a stain upon this country's history. Please sign now, and let's put an end to Robert E. Lee Day throughout the country.